I'm glad you like it, Scott. 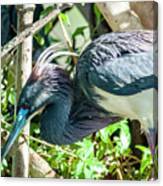 Thank you very much for the feature in the group "FAA Portraits - Birds." I'm glad you like it, Don. Thank you very much for the feature in the group "A Birding Group - Wings." I'm glad you like it, Don. Thank you very much for the feature in the group "Coastal Waterbirds - Shorebirds." I'm glad you like it, Doug. Thank you very much for the feature in the group "Animal Photographs." I'm glad you like it, William. Thank you very much for the feature in the group "Wild Birds Of The World." I'm glad you like it, John. Thank you very much for the feature in the group "Images That Excite You." Thank you for the kind comments, Robert. 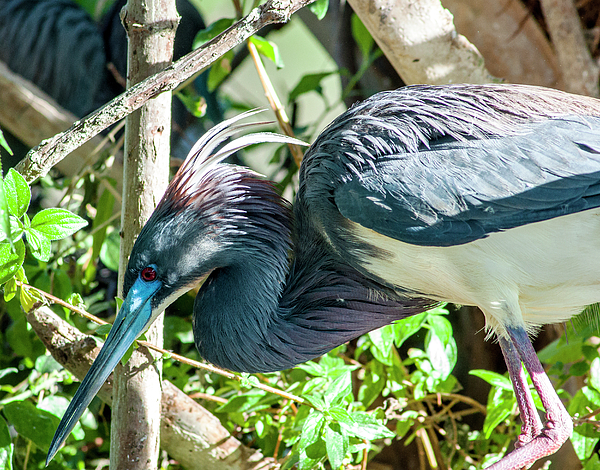 A tri-colored heron bends over for a closer look at the water below him at a rookery near Kissimmee, Florida. 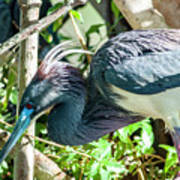 Tri-colored herons (egretta tricolor), formerly known as the Louisianna heron, can be found in the coastal sub-tropical swamps of the southeastern United States, Mexico, Central America, the Caribbean, down to central Brazil and Peru in South America. It is a medium sized slender heron measuring from 23.6" to 27.6" in length with a wingspan between 37.4" and 38" with a long slender neck and long orange yellowish-brown bill with a black tip.The long legs are yellow or orange as well as the feet. The head, neck, back and upperwings are a blue-grey and a white line runs down the neck to a white belly. During breeding season the bill turns a bright blue and some white feathers extend from the back of the head. Tri-colored herons eat mostly small fish that they often chase and herd with open wings, sometimes looking like they are doing a crazy dance.